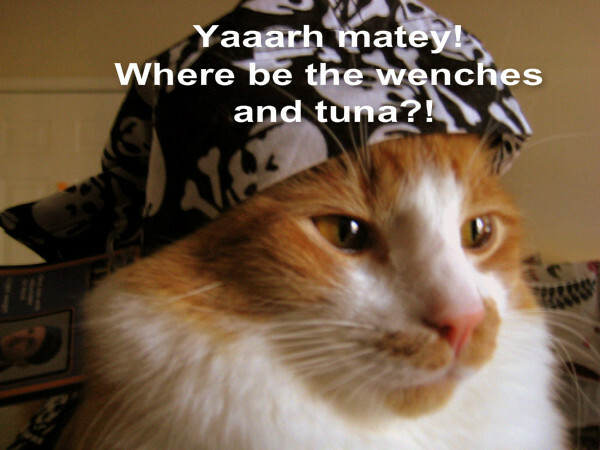 Yarr … u can has teh wenchez. Ai will has teh toona. Wenchez has hands an kan operrate the kan openur. Better keep at leest wun. Arrgh. U hazza poynt, adn nawt juss at teh tip ob ur simmitar (or wutebber dat fing is). And conga rats wif rum on yer nawt sekond! Fankeez, maytee. Aifinks ai’ll hastu boyl doz rats in teh rum iffn teh toona nawt arrybz. Nawt tu fergettin tu add sum limez soze yu nawt gettin teh pleh skurbee! Ai BEGZ UR Pardun!!? Ratz iz nawt nomz!! Pre pairz tu be boarded At teh V.E.T.!! Teh cheezknife izza gud touch. Arrgh, aiyd be happeh tu leebin teh rats aloan iffn yood probyde teh toonaz, maytee. Opunz teh sammun flavor temptashunz pakket and drawps elebentee treetz intu teh kitteh carrier. Run up teh Jolly dodjer, man teh cannunz! Aaaak! Hao duz ai gets owtta dis fing?! er..fankees…enny moar milk bonez…say fur a neevun trayd fur te treshure map?? Whale, wii iz awf tu find teh toona fleetz, see u when wii git bakk. Sigh….awlrite, whoo buried teh treazhur in teh kitteh litter….? In Cheezland, the time is 18:45.